Preflight Verifier displays a dialog which will show each error it detects, along with the relevant page and object. The advantage is that it very easily will detect a host of errors your visual review may easily miss, and takes at most a few seconds to complete. Once you are past this initial screen, you then proceed to the next step, PDF Export. The various options are explained in the chapter The Final Output. For our purposes here, we will say that this takes a few seconds to run the export function, and in some cases it may need to be repeated. This might come about after you examine the PDF on screen or in printed form. If the document is to be printed, the final true test is viewing the actual printed output. A document created for the screen can only be checked on screen. * Safety margins are not to be confused with document margins. This includes the tolerance of the finishing equipment, trimming and binding, gluing, and perforating. This will depend on the specific printing equipment, and should have been checked at the beginning of the design process, since it may affect the design and layout of page elements. More specifically, you don't want important content in areas susceptible to loss during finishing. ** There are many kinds of black, and you may in fact use different blacks in the same document and on the same page. Once your document has been printed out in quantity, these different blacks may be incompatible and at that point it's too late. Imagine you have a photo with a margin which fades to black, yet this turns out to be a different black than the background around it. An attempt at a sublime transition becomes ugly. Copyediting and proofreading are related tasks. The former applies to reviewing the source materials for accuracy, grammar, and content. The latter, proofreading, as the name implies, happens after you have generated a proof of your work for a final assessment, not only of the issues checked during copyediting, but also fonts, layout, and all the visual aspects of the end product. You begin on bad footing with your reader if your work isn't coherent, concise, and pleasing to view and read. As it implies, copyediting is best done before your create your layout, set and adjust your styles, since this is the time when editing of the content is easiest. It also avoids creating other problems which might change the layout, such as when you significantly add or remove material. This having been said, you may still find yourself changing the content in the proofreading stage. The choices for hyphenation may be inappropriate and need editing. You simply may miss some grammatical errors until this final stage. It may be that once you see the layout a change in the text content may improve the flow of text or deal with some ugliness like rivers or gaps in the lines of text. Thus, proofreading is also a very essential part of the editing process. 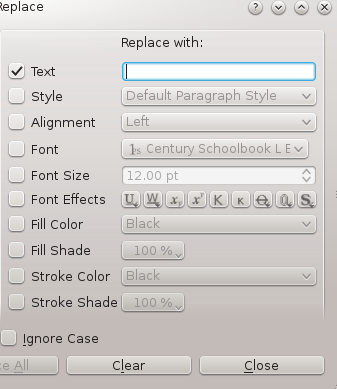 Scribus has a built-in spell-checker [Item > Check Spelling], though it admittedly is a bit cumbersome. Typically, your word processing software will have a much easier to use and better spell-checker. Even so, as good as these are, they are not error-free, so it is up to you to find mistakes these automated utilities leave or create. Once errors are identified, they must be corrected. On a simple operative level, this only requires identifying an error, going to Edit Contents mode, and then going to and fixing the error. This seems simple enough, but requires rapt attention and efficient visual scanning. You have at your disposal another tool in Scribus for this task: Search-Replace. Once you have selected a text frame, select Edit > Search/Replace. The advantages include the fact that your errors will be found very quickly and without mistakes. 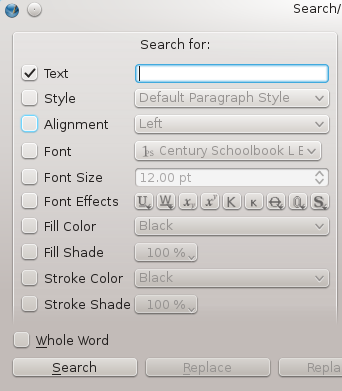 You can start by simply entering the text to search for – it's not necessary to fill in all these fields. Immediately you will be presented with the appropriate location, then you may choose to enter the text to replace the error, and choose to replace one at a time or all subsequent errors also.